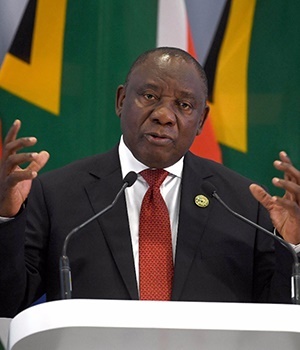 President Cyril Ramaphosa said his Russian counterpart Vladimir Putin accepted that South Africa’s economic condition won’t allow Pretoria to sign a nuclear deal, when the leaders held bilateral talks on the side lines of the Brics Summit on Thursday. Addressing reporters on Friday at the end of the three day gathering in Sandton, Ramaphosa confirmed that Putin wanted to know where the country stands on the planned nuclear build programme. Ramaphosa said South Africa gave Russia “a clear, straight-forward answer”. “Our economy is not operating at a level where we would like it to and we have got huge financial constraints. We are not able to proceed with a nuclear build programme and President Putin was quite relaxed about this,” he said. Russia has been one of the countries vying to build new nuclear power reactors in South Africa that would produce around 9.6 gigawatts of energy. But the controversial project, which gained momentum during former president Jacob Zuma’s term in office, has been criticised for being too costly for the country's struggling economy. Ramaphosa said Putin conceded that SA should focus on its economic issues “and when the situation changes, we can keep talking”. He stressed the answer he gave to Russia was a position that South Africa had articulated before. The summit of the grouping of five emerging economies, Brazil, Russia, India, China and South Africa took place amid a growing trade war between China and the US. The grouping signed the Johannesburg Declaration on Thursday to improve intra-trade and spoke out strongly against unilateral trade. This week, China committed $14.7bn (R193bn) of investment to South Africa, signalling growing partnership between the two countries, although trade levels remain skewed towards China. Ramaphosa defended South Africa’s close ties with China, which is the country’s single biggest trading partner. He stressed that South Africa was a sovereign country and free to choose whoever it wanted to associate with and that the ties are “not at the exclusion of other countries in the world". “Of course, all of us are safeguarding our own sovereignty, we are independent countries, and all of us can choose whoever we want to associate with, and as we associate together in Brics,” he said.